DCIG encourages prospective portfolio companies that fit within the desired guidelines to submit an application through the GUST PLATFORM which the group utilizes to aid in sourcing and managing its deal flow and portfolio companies. A brief outline of the investment process as well as some of the documents that should be included are listed below. After Delaware Crossing receives an Executive Summary that satisfies the application requirements, a representative of Delaware Crossing will review the material and present it to one or more members for endorsement. If the Executive Summary is endorsed by a member, then a brief meeting will be arranged between the company and the Screening Committee. Based on that presentation and any follow-up preliminary due diligence, the company may be invited to present at one of the membership meetings. Each of our chapters hold general membership meetings periodically, usually once every four to six weeks. At each membership meeting, one or two companies are invited to make a 30-40 minute presentation. The general structure of the entrepreneur presentations usually consists of an initial 15-20 minute company overview/pitch, followed by a time of Q&A. Topics covered in both the initial and Q&A portions of the presentation often include: management introductions, investment terms and exit strategy, company overview, product/service, industry overview, competitor analysis, marketing plan, historical performance, financial projections, requested capital, and expected usage of that capital. At the conclusion of the presentation, the entrepreneur is excused and the members privately discuss the proposal. At the conclusion of the prospect’s presentation, the membership decides whether the prospect warrants further attention. If so, the Managing Directors designate one or more members as Deal Managers, one of whom is designated as the Lead Deal Manager. Deal Managers perform due diligence, evaluate valuation, communicate with and solicit interest from other members, negotiate a transaction and, if an investment is made, serve as the ongoing point of contact, whether as a member of the board of directors, an advisory committee or otherwise. Due diligence includes, but is not limited to, review and analysis of the applying company’s: Business Model, Target Market, Strategy, Technology, Management Team, Existing Advisors and Current Investors, Financial Status, Projections, Term Sheet and Exit Scenarios. Members who wish to participate in an offering create a new limited liability company for purposes of that investment. 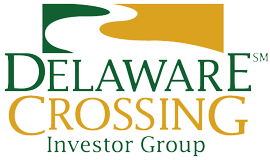 From the perspective of the portfolio company, Delaware Crossing Investor Group is one shareholder. Investments are typically in Series A Preferred Stock, although convertible debt structures are also considered. The group will rarely invest in pass through entities (i.e. LLCs or LLPs) or invest via common stock issued by the portfolio company. Delaware Crossing may assist its portfolio companies in securing next stage financing from a venture capital firm, and will consider follow-on investment. Following the offering, the portfolio company will be requested to report on substantial changes to its business or business status, positive or negative, on a quarterly basis (within 30 days of close of calendar quarter). The portfolio company may provide D&O insurance and/or full indemnification of directors in cases where a member is serving on the board. From time to time, Delaware Crossing will engage the services of a Post Investment Coordinator to organize follow-up reports and assist deal managers on portfolio company matters. With respect to investment vehicles formed for Delaware Crossing investments, Delaware Crossing will ask an outside accountant to prepare Form K-1s and other tax reporting documentation as appropriate, based upon the information provided by the portfolio company. Delaware Crossing bears the accounting expense as a general expense of the membership. Delaware Crossing charges no fees to Entrepreneurs and applying companies to submit materials to Delaware Crossing or to present to the group. Delaware Crossing strongly believes in the importance of being accessible to the entrepreneurial community. Delaware Crossing takes no commissions; however, Delaware Crossing does ordinarily require reimbursement of legal, accounting or other administrative expenses in connection with completing a deal, at the rate of 2% of invested funds, at the time of the investment or any follow-on investment. At present there is no ongoing management or other fee payable by portfolio companies. Please include projections for 3-5 years. Prospective companies should apply to Delaware Crossing through its Gust web-based system.